�This concert of 20 April 1940 was recorded via landlines at the RCA Victor Recordings Studios on East 24th Street. At the same time the concert was recorded on the Ninth Floor of Rockefeller Center in which building NBC also had its largest studio, 8H. The air checks are inferior in sound to the landline transmission. I was particularly happy to obtain a copy of the landline recording of this concert as the sound, remarkably good for an 8H Studio transmission, derived from using optimum microphone placements, reproducing the good sonics I heard sitting in the 8H audience during 1949 and 1950. I was amazed at the force, the stature, the tonal world that flooded out of the PICTURES AT AN EXHIBITION. Toscanini conducted PICTURES only four times for the NBC broadcasts. We previously released the concert of 9 APRIL 1944 in 1998 through Naxos, but we were disappointed in the sound of the Wagner excerpt, and the Mendelssohn Violin Concerto was off-pitch by 1% to 1.3%, something that did not characterize our master. Ever since then, we have hoped for the opportunity to re-issue it with the PARSIFAL excerpts in its original sound and the Mendelssohn on-pitch. The concert of 20 April 1940 provided enough space to do so, offering, as well, in this restoration the final measures of the PARSIFAL Pr�lude, previously missing. The PARSIFAL Prelude and Good Friday Spell were excerpts which many music lovers, devotees of the Toscanini broadcasts, hoped to hear him conduct. The Maestro had conducted the Prelude in his All-Wagner broadcast on 5 March 1938 and again on 23 March 1940, to which he added the Good Friday Spell and other orchestral music from Wagner�s sublime work. Though he conducted many excerpts from Wagner�s music dramas in the subsequent seasons, it wasn�t until the 9 April 1944 concert that he conducted once again this unforgettable music from PARSIFAL. The concert marked the reappearance of Maestro Toscanini with Jascha Heifetz, who had previously been heard in the Beethoven Violin Concerto in the concluding New York Philharmonic concert (29 April 1936) with which the old Maestro left the Philharmonic directorship. This portion was not broadcast (Heifetz and Toscanini recorded the Beethoven Violin Concerto in 1940). Previously Heifetz had been heard with the Philharmonic in the Brahms Violin Concerto which Toscanini conducted as part of his Brahms Cycle in 1935. (See IPCD 1025-4; our number C1077). 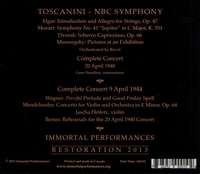 �This recording of 20 April, 1940 comes to us as the result of an historical accident that combined the genius of a great conductor, the skill and dedication of the members of his specially-created, hand-picked orchestra, and the fact that both conductor and orchestra were in the service of a recently-evolved, powerful and influential nationwide broadcasting organisation, the technological excellence of which improved by leaps and bounds during this period (1938-1953). We, today, can hear for our own betterment and enlightenment the artistic results. Indeed, in many respects, we can hear those results more completely than many of those listeners were able to in the 1930s, 40s and early 50s. In those days, few radio receivers could reproduce the same level of sonic fidelity by which we hear these performances today; only the relative handful of those persons who comprised the studio audiences at NBC, by being physically present in the same auditorium, can be said to have had an advantage over us. 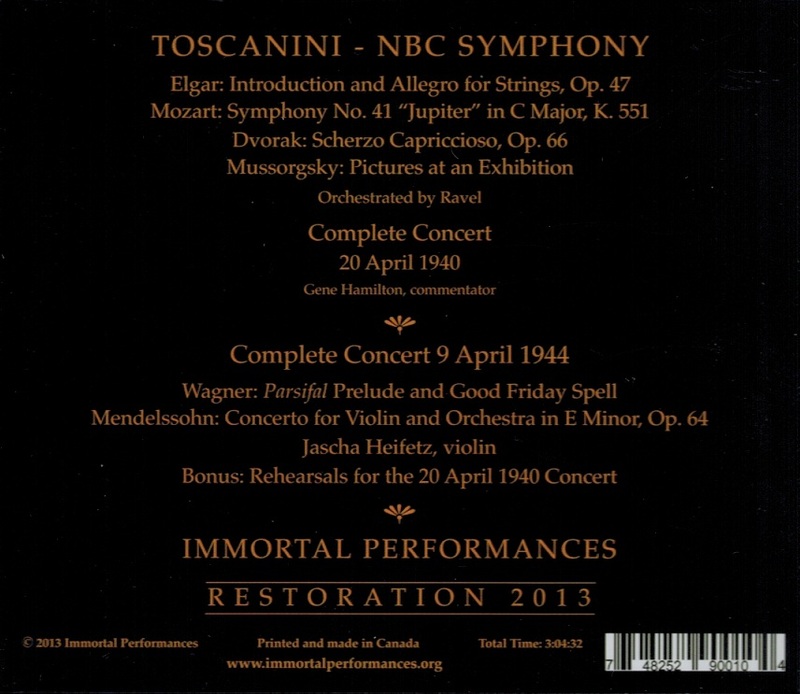 This album contains the entire concert that Toscanini conducted with the NBC Symphony Orchestra on 20 April, 1940. In the first place, the orchestra grows in size from first work to last: beginning with strings only, and ending with the very large forces Ravel�s orchestration of Mussorgsky�s PICTURES AT AN EXHIBITION demands. There are three extant Toscanini accounts of Mozart�s �Jupiter� Symphony. The performance contained in this concert is the first (the others date from 1945 and 1946) and it is by far the finest. 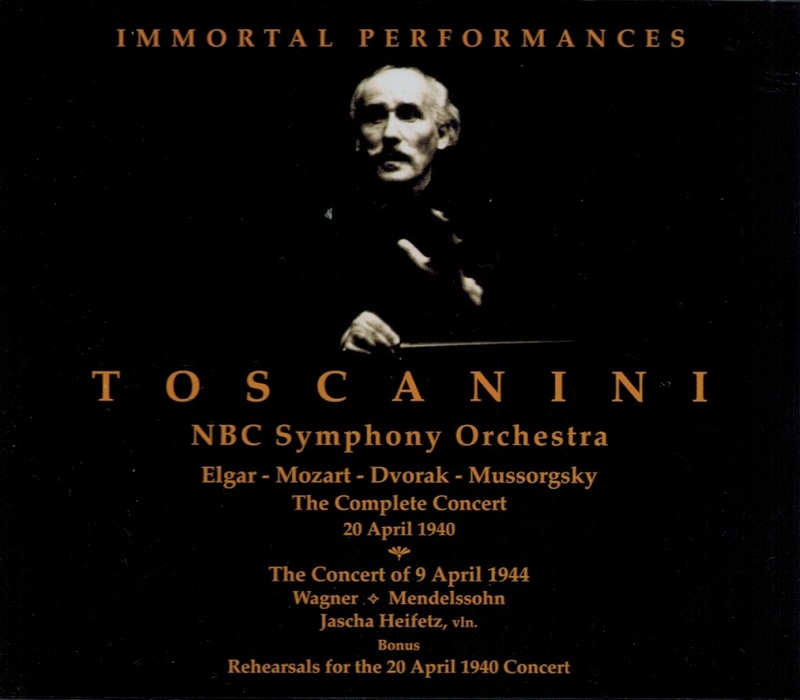 Mortimer H Frank, in ARTURO TOSCANINI � THE NBC YEARS has stated the case admirably: '� the 1940 broadcast is everything the 1945 and subsequent studio recordings are not: free from excessive haste, texturally transparent, and remarkably flexible in rhythm'. It is fashionable today to speak of the special qualities of Dvor�k�s music when played by compatriots of a composer, and there may indeed be something in such a view, but there are equally compelling attributes in this performance that transcend national boundaries. In the first place, the NBC Symphony is magnificent. Their ensemble is superb; the rhythmic �lan and subtly expressive playing of these musicians is wholly admirable. Toscanini�s death in 1957, a few months prior to what would have been his 90th birthday, should cause us to reflect that he was almost 16 years of age when Wagner died in Venice, early in 1883, at the age of 69; the composer�s final music-drama, PARSIFAL, had been heard for the first time at Bayreuth just six months before. As Debussy wrote of PARSIFAL � it is �one of the finest monuments in sound ever to have been raised to the everlasting glory of music�.